This is a short multi starting at St Michaels' village sign. St Michaels is a village on the weald of Kent and has become a suburb of the nearby town of Tenterden. 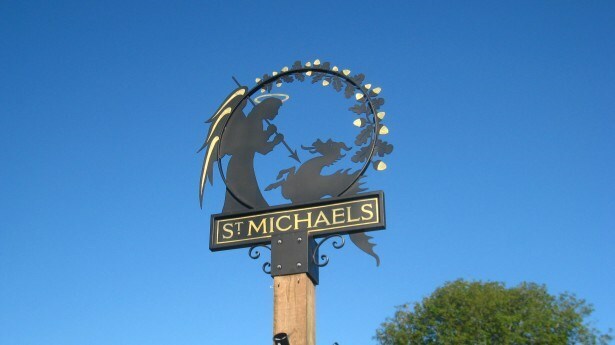 The village sign, made of iron, depicts the struggle between the Archangel St Michael and the devil in the form of a dragon. As the story goes, the battle was won by St Michael, who forced the dragon out of heaven and sent him down to Earth. Until 1954 the was served by Tenterden St Michaels railway. Nothing now remains of the station, but the route of the line can still be followed along the cyclepath which repalced it. A tunnel to the north of the site where the station stood still exists under Shoreham Lane. A level crossing also once existing passing over Grange Road. The church of St Michaels and All Angels stands to the north of the village sign. The church is made of Kentish ragstone and Bath stone and was consecrated in 1863. The building of the steeple was completed some 12 years after. The village has taken it's name from this church, having previously been called Boresisle. The information you require to find the cache can be found on a plaque under the village sign. C = The final digit of the year in which the sign was unveiled. The cache is a small cliplock container and is approximately quarter of a mile away. Tb orlbaq gur tngr naq ybbx yrsg.